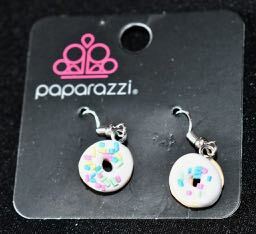 A day or so before Asia died, Barbz sent her a box of special beaded dog donuts; that was Asia’s last meal. And so when Asia died, Barbz declared that it was National Beaded Donut Day and suddenly photos with Beaded Donuts flooded my Facebook feed. The photos kept coming — it quickly became International Beaded Donut Month! It was incredibly touching and wonderful. And so — because of Barbz — a Beaded Donut was transformed into a symbol of caring and support and hope. Since then, I have continued to receive Beaded Donut things. I treasure each item because I understand them as meaning that somebody rested his/her heart and mind on me. Like Alise, who sent me these wonderful little notecards that I use all the time. 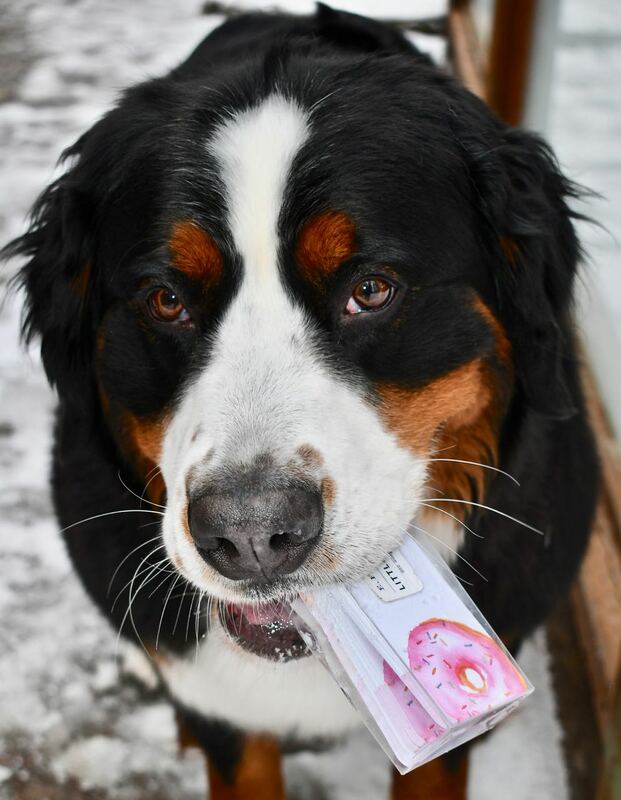 Alice sent donuts to the dogs — “just because,” she said in her note. Secret Santa sent a wonderful dog toy. My neighbor showed up with those fun earrings. Beaded Donuts represent Community. They are a way to connect and communicate without needing to think of just the right words. Like a dog, a Beaded Donut is a community builder. In honor of all that is wonderful about Beaded Donuts — including and maybe especially every person who transformed a simple donut into a powerful means of expression and connection — I decided when Claire was a puppy that she would have a Beaded Donut theme instead of a color. Elizabethanne made donut crate pads that follow Claire on her adventures. Claire’s next adventure is to complete a Novice Draft Dog title so that she can be a Versatility Dog — like both of her parents and generations of dogs before her; I think she will be an eighth or ninth generation Versatility Dog. And for that adventure, GCH Claire TD required a harness. And so Claire has a special harness that reflects and honors all of you very wonderful people in the Beaded Donut Community. Thank you to every single one of you. And, of course, donuts all around.